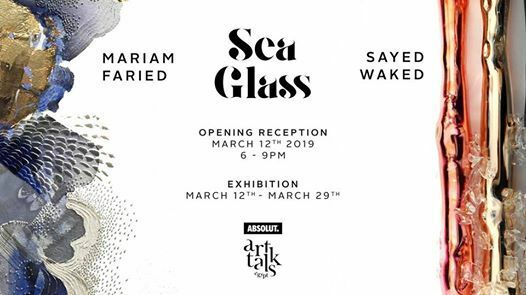 ArtTalks is presenting for the second year the dual exhibition of 2 artists paving the way in their specific field with their unique talent Mariam Faried and Sayed Waked. 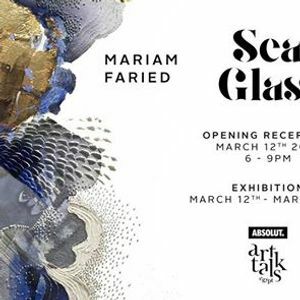 An exhibition which is an hymn to the amazing grace of paper and glass sculpting: Sea Glass. As an analogy, the long weathering processes that produce natural frosted glass in the sea , our emotions and relationships with others acquire its characteristic depth, shape and motion through time and bonding. Both artists express our relationships through translucent artworks that scatters the light which passes through their medium , thus blurring images while still transmitting light. Our life is a deep sea and what we go through is symbolized by waves. which is essentially serving as an opposing force to push you back or make you move forwards. There are two conditions: one, water is flat, and two, water is rough; those two different life conditions are influenced by wind, tide. This can be good or bad, depending on the amount of your persistence and strength and the size and distance of wave vis-à-vis of you. Confused waves can drive you nuts but what goes up, must come down... Go deep inside yourself during calm waters and learn how to manipulate the inner self - vessel to provide yourself a comfortable sail. Sometimes slowing down and changing landscape into a slalom course can work to your wellbeing but the A life glide can never be complete without the presence and the melting with others . It is co-creation ; independent souls construct shared stories . Make the direction of the waves flow with you : Surround yourself with people who raise you over the tide and be transparent in your connection. Mariam Faried (1986) uses paper and a cutter to create colorful, highly intricate works of art that boggle the mind. Unlike most painters or artists, the most important tools in her work are not only paintbrushes but needles, cutters. There is always a new way to use paper! Pierce, shred, carve and slice it is an intricate art of paper perforation technique to create extreme embroidery. Paper is a material which offers many textures, aspects, and colors for her to mix all these possibilities and she also makes time for playing with other material like silver strings, gold-leaf and acrylic. Her tool arsenal evokes fire outburst, transparency and other elements for paper cutting to become an extension of painting. Paper is central to Mariam Faried, her mastered technique is driven to produce such elaborate confections from this humblest of material. She is inspired by the contemporary paper cutting to Japanese Katagami stencils, Mexican Papel Picado and the medieval practice of excising illuminations from manuscripts. Sayed Waked (1976) graduated from the Faculty of Specific Education, Cairo University in 1998 and member of the Syndicate Fine Arts. His rural childhood had a large impact on his artistic career as he had the chance to contemplate beautiful landscapes and explore different media abundant in his environment. After graduation, Waked worked as a designer at a flame work glass factory producing handmade glass vessels and sculptures, which made him proficient in sculpting, engraving and decorating glass. He actively participated in the fine art arena in Egypt with his drawings, paintings and sculptures. His glass creations featured in many exhibitions since 2000 to the present, starting with a small artworks exhibition. He held three solo exhibitions and participated in several national and youth art events. Waked uses both figuration and abstraction to express his vision about human relationships and he adapts the unique characteristics and aesthetics of glass to this endeavor. The exhibition is proudly sponsored by Absolut .